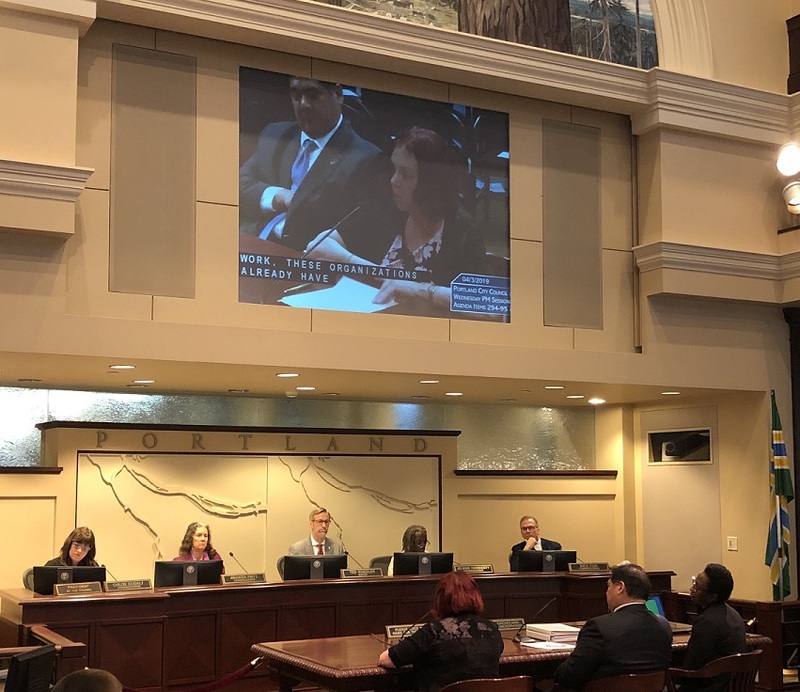 Portland City Commissioner Chloe Eudaly’s proposed applicant screening and security deposit proposals had afternoon hearings in City Council on Wednesday, April 3rd and Thursday, April 4th. Wednesday was reserved for invited testimony and Thursday was dedicated to public comments. Together the two proposals are more than 40 pages long. For security deposits it would limit the amount a housing provider can ask for, restrict which damages could be applied to a security deposit, and forces the deposit amounts to be in individual bank accounts. For applicant screening it would lower the income requirement from income of 3x the rent to only 2x the rent, set up a “head of household” designation so other residents in the dwelling wouldn’t be equally accountable and singles out a disability waiting period and “jump the line” provision in the application process – yet makes no accommodations for other protected classes in Fair Housing. The restrictions and confusing protocols of setting reasonable screening parameters for applicants with past criminal histories is the most egregious. Deborah Imse, Executive Director of Multifamily NW testified on Wednesday in opposition citing the cost burdens these policies would inflict on affordable housing providers. Commissioner Fish and Mayor Wheeler did comment on the complexity and cost to implement ($500,000 to start and $400,000 a year ongoing) the proposals. Tyrone Poole of OneApp testified his concern that while if these policies were implemented certainly more applicants would be approved, however most rentals in Portland are run by sole operators, who are not equipped to assist these higher-barrier applicants be successful. He argues it’s the individual mission and capacity of property management companies that dictate their criteria, not a risk assessment. Many landlords testified these policies would impose an undue burden and force rents to raise. Several stated they would rather sell their rental houses which would reduce the number of rentals in Portland. Like concerned housing providers that came to testify, Portland Tenants United (PTU) recruited a similar number of supporters to attend the hearings. The next date these polices will be in front of City Council is Thursday, April 25th. There will likely be further amendments and a vote. Commissioner Hardesty is a likely supporter with Commissioner Eudaly, so it’s up to Commissioner Fritz, Commissioner Fish and Mayor Wheeler to force workable amendments or vote down the package entirely. If passed it is set to take effect on October 1st, 2019.